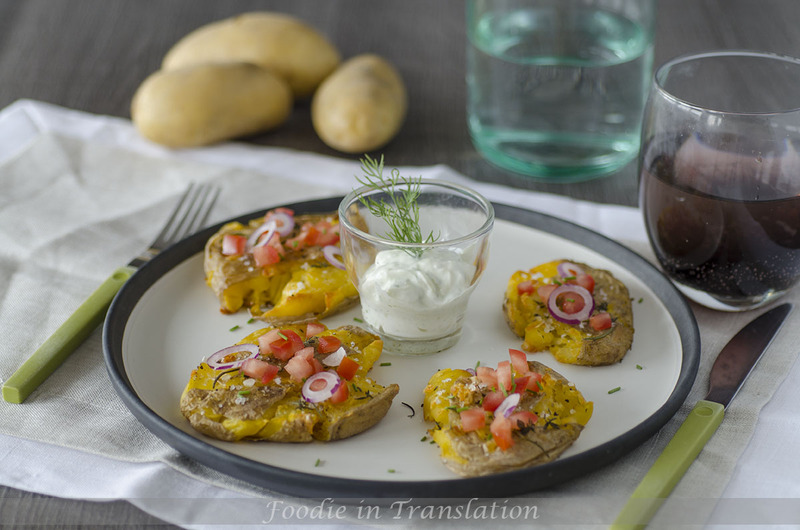 A new way to cook one of my favourite vegetables: smashed roasted potatoes!! I bake them, steam them, sauté or fry them. I serve them with meat, fish, onions, peppers or simply on their own. I saw this recipe a lot of times on the web. I fell in love with it since the first glance and after a bit I could finally prepare and taste it at home. They are crispy and we really enjoy them for dinner. My partner, who was a bit sceptical at the beginning, took them three times and asked me to make this recipe again soon. First important think: do not peel potatoes. Wash carefully, brush and steam them for 15-20 minutes until they are almost done. Pre-heat the oven at 200°C. Drain the potatoes and place them on a baking sheet lined with parchment paper. 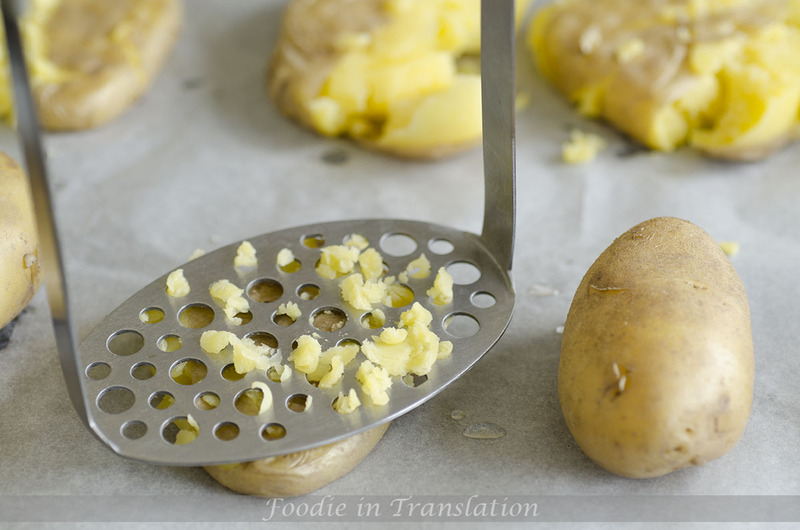 Take a potato masher and mash the potatoes with care. Season with salt, pepper, fresh thyme and rosemary and a drizzle of olive oil. 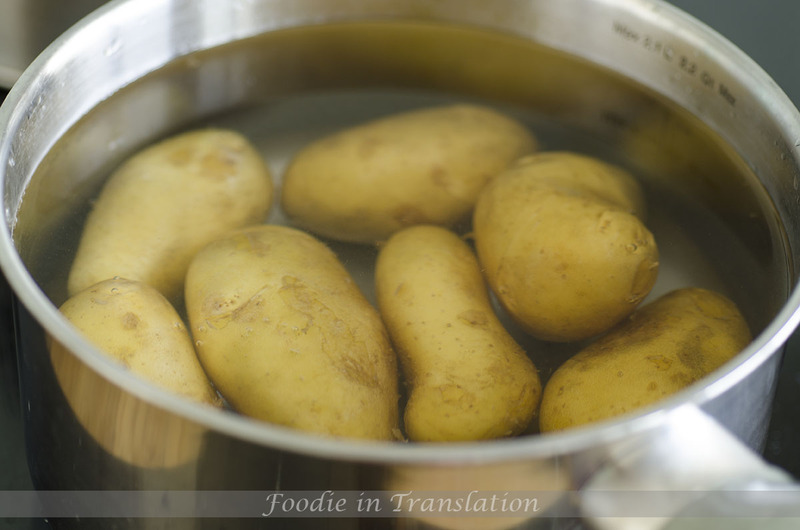 Put into the oven and roast for 20-30 minutes until the potatoes are golden brown and crispy. Meanwhile, dice the tomato and slice the onion. 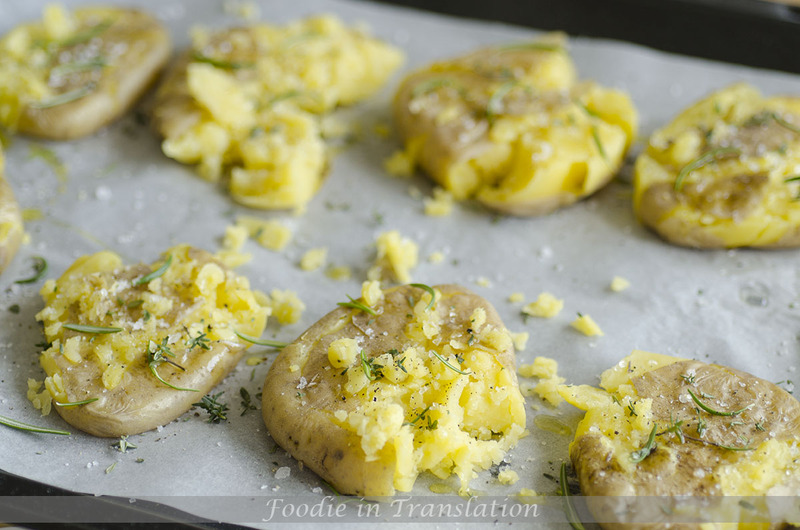 Remove the potatoes from the oven, sprinkle them with tomato, onion and chopped chives. Serve with tzatziki sauce and meat. There you go, my smashed roasted potatoes with tomato and onion are ready to be served.